WASHINGTON (Reuters) -- U.S. regulators signaled that their investigation into Takata Corp. airbag inflators will expand beyond 11 automakers, amid signs that vehicle design could play a role in whether the devices pose a deadly risk to the public. 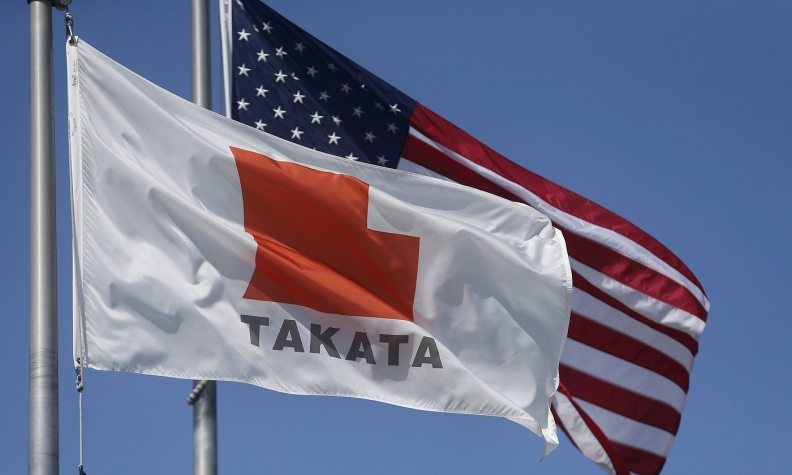 National Highway Traffic Safety Administration chief Mark Rosekind said his agency can add more auto manufacturers to the consent order that regulators announced with Takata in May. He said some carmakers could also begin to move more quickly when they suspect a potential problem. On Thursday, NHTSA expects to make a case in public that it should coordinate the Takata recall to ensure that an estimated 23.4 million airbag inflators installed in 19.2 million U.S. vehicles from 11 automakers are properly replaced. "We'll try to be very specific on Thursday, but it goes beyond the 11," Rosekind told reporters on Monday. "All of these are fitting under the investigation we currently have. And we'll be talking about all of those," he said. The airbag inflators, which can explode with too much force and spray metal shrapnel into passenger compartments, have been linked to at least eight deaths and more than 100 injuries worldwide. Takata declined on Tuesday to comment on which automakers' cars could be added to the list under investigation. The list already includes vehicles manufactured by Toyota Motor Corp , Honda Motor Co. Ltd and General Motors . "We're concentrating on producing replacement parts and we're working with automakers to contain the issue. We plan to continue our co-operation with NHTSA," a company spokeswoman said. Rosekind's comments follow news in August that regulators directed the U.S. units of Volkswagen AG to provide information on the June rupture of a Takata side airbag in a 2015 model VW Tiguan. The report does not fit the pattern of other cases, which have involved front airbags of older model vehicles. Rosekind also said he believes automakers could follow the lead of GM by moving quickly on Takata-related recalls as additional attention is focused on the danger. "It would not surprise me if other people decide to deal earlier and faster with these issues," Rosekind said. Over the weekend, GM recalled about 400 2015 vehicles in the United States after being notified by Takata that tests at a production plant in Mexico showed failures of side airbags. The Takata tests were performed on Oct. 5, and it notified GM the following day. The GM recall affects six models produced earlier this year, mainly in February and March, including the Chevrolet Equinox and Chevrolet Malibu. No injuries or deaths have been reported in this specific recall, a GM spokesman said. Experts say the ammonium nitrate used as a chemical accelerator in the inflators could become unstable after being exposed to high humidity over a period of time. Some have suggested that auto design -- including how well sealed passenger compartments are against humidity -- could also be a factor. "Think about age, high humidity, all the different factors. Now you add design of the vehicle," Rosekind said. Newer Takata inflators have not been shown to be a problem, he added. "So far the testing is showing that the newer ones seem to be solid," Rosekind said. Takata said in a statement Monday that it has increased production of airbag replacement kits to 1 million per month. Takata also said it plans to launch a digital ad campaign, using Google and Facebook, to reach owners of recalled vehicles. “The digital advertising campaign we are undertaking -- the first ever campaign of this type by an automotive supplier -- is designed to ensure that anyone with a potentially impacted vehicle is made aware of the issue," Takata CEO Shigehisa Takada said in a statement. The first ads will focus on areas with persistent heat and high absolute humidity, Takata said. That's where the risk of a ruptured airbag inflator is highest.